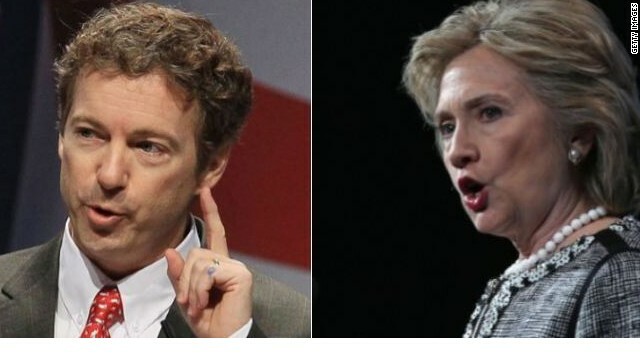 (CNN) - Hillary Clinton and Sen. Rand Paul went toe-to-toe in the media this week, amplifying 2016 tension between perhaps the two most active potential presidential candidates. On Tuesday, the Kentucky Republican argued Clinton was out of touch for saying she was "dead broke" after she and her husband left the White House. "She's going to have some surprises once she gets out of her limousine and meets the American people," Paul told reporters on Capitol Hill, according to reports by Politico and Breitbart. "If she wants to come to Eastern Kentucky, to my state and talk to miners who are out of work and see the despair in their faces and talk about her personal plight as being the poor spouse of the president, she's welcome to take that message around the country," Paul said. Clinton first made the comment in an interview that aired Monday on ABC News. She told Diane Sawyer that her family was "dead broke" and in debt when they left the White House more than a dozen years ago. Clinton made the comments in defense of the hefty speaking fees she commands since stepping down as secretary of state last year. Clinton later added her family had "no money" at that time and "struggled to piece together the resources" for mortgages and her daughter Chelsea's college education. The Clintons departed the White House in debt due to enormous legal fees. By the end of 2000, their debt totaled somewhere between $2.28 million to $10.6 million. But former presidents and first ladies have the ability to make a lot of money, and the Clintons were no exception and have done so. Their assets grew quickly. Critics quickly seized on her remarks, which made waves in social media. Clinton attempted to clarify the comments in an interview Tuesday morning with ABC's Robin Roberts, saying she understood the criticism but recalled her family was "something like $12 million in debt" in the winter of 2001. "Let me just clarify that I fully appreciate how hard life is for so many Americans today. It is an issue that I have worked on and cared about my entire adult life," said Clinton, who later noted that getting out of post-White House debt "was something that we really had to work hard" to accomplish." But Paul labeled her argument a "sad song." "The sad song of her reporting her financial difficulties and the fact that she hasn't driven herself in a car in 17 years, doesn't sound like she's going to connect real well with the middle class," he said, according to reports. The former secretary of state admitted in January that she hadn't driven a car since 1996. Paul, who's considering a presidential bid of his own, has long been a fierce critic of Clinton, especially on her handling of the deadly 2012 terror attack against a U.S. compound in Benghazi. He's also argued repeatedly that former President Bill Clinton's affair with Monica Lewinsky is a liability for Democrats. Clinton was asked about Paul in the interview with Sawyer. "He can talk about whatever he wants to talk about," Clinton said. "And if he decides to run, he'll be fair game, too." A Washington Post/ABC News poll released Sunday indicated that if the 2016 presidential election were held today, Clinton would defeat Paul, 53%-43%, among registered voters nationwide in a hypothetical matchup. CNN's Dan Merica and Robert Yoon contributed to this report. Why are neo-cons so jealous of the successful? If he's really a Doctor, he's more than likely a mediocre one at best. Otherwise why be in politics? She should have followed Rands' example and just certified herself as a doctor and gone into practice. Can Paul understand that people struggle? It doesn't sound as if he cares about that. Clinton has two things that many GOP candidates strive for: a pull themselves by their bootstraps story; can be a ordinary, average like person. And to think, she went broke for the same reason the people in Kentucky did – REPUBLICANS. Good for you Bill and Hillary...I sincerely mean that. Only in America could that be a possibility. Now , lets see how that plays out on the campaign trail ( if and when) regarding her position on income inequality . How does this sit with the liberal left talking points? Spin me , please. Hillary Clinton seems to be making some simple mistakes. She never should have implied that she was broke. And she should be attacking Rand Paul to put him on the defensive whenever he starts attacking her instead of waiting for later. Rand Paul, for example, is on record saying the US should let Russia do whatever it wants with Europe. I have to say I really liked Hillary's response to Rand "if he chooses to run he'll be fair game too." Sure Rand – go ahead and criticise her for having worried about their future since they were $12MM in debt from worthless Ken Starr republican "investigations" that never went anywhere. Go ahead and critcize, Rand. The battle hasn't even begun and he's already running low on fuel. -most of these guys are pretty much out in next election, with Eric Cantor exit which is good days ahead for USA. God bless!!!! !